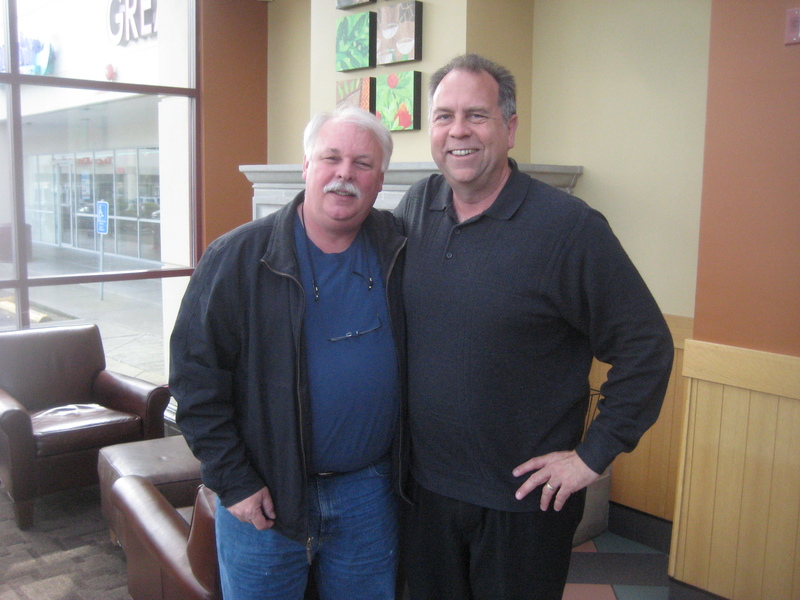 I spent the fastest hour of my life today, sitting around at Starbucks and getting caught up on life with Mark Ericks. Mark and I go back quite a ways to my Bothell days. By the time the 1990s had rolled around, our paths had crossed a few time through mutual friends. But we really hit it off at one of our Murdock, Hunter & Alice promotional events, when a Bothell family won our “Deck your Halls” contest. That day, we had arranged for the “World’s Shortest Christmas Parade”. There was a marching band, Stan Boreson, the mayor and the police chief–Mark Ericks–who helped with traffic for a total of one block. I think the concept was right up Mark’s comedy style and we stayed in touch after that. I put him on the radio when I took a tour of the new Bothell public safety building which was his baby. He was SO into the project, for a time, he lived in a trailer on site just to make sure things went smoothly. I was asked to emcee his retirement party when he stepped down as city police chief. A short while later, I made phone calls and stood on street corners holding campaign signs to help get him elected as a state representative. He just finished his sixth legislative session (or “tour of duty” as he likes to call it) and as the Vice-Chair of the Ways & Means committee, he was constantly being wooed by lobbyists. In fact, his day was actually broken up into 10 minute segments…..and that’s how his time was dished out to everyone who wanted to talk to him. Even his “walking time” was booked…when people would be assigned to get their chatter in while he was walking from meeting to meeting. I knew this when he first ran for office, but when you got a guy like Mark in Olympia, you relax a little and just assume that he’d make the same choice you would make, if you were that informed. One thing is for sure, he’s one of the most stand-up, straight-shooting people I’ve ever met. Of course, the guys at the firing range might argue about the “straight-shooting” part, but these guys have weapons and I’m not going to argue. Thanks for the friendship, Mark. Fingers crossed on the big news.